I've already shown you Cashmere Bathrobe, and today I have the other polish to show you. Essie After School Boy Blazer is a deep dark navy cream. Nothing special about it, just a gorgeous vampy blue. 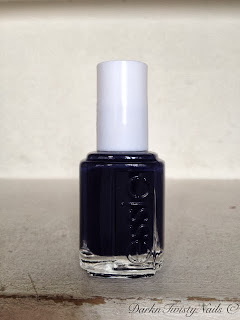 The thing that makes this polish really good, besides the stunning color, is the formula. It's opaque in 2 thin coats, but if you're in a hurry, you could get away with just 1 thick coat (although I would always recommend doing 2 thin ones). It dries fast and the consistency is really nice. It dries extremely glossy, just the way I like my polish! It almost looks black, but you can still tell it's navy and I like these types of colors a lot. Especially in fall and winter. 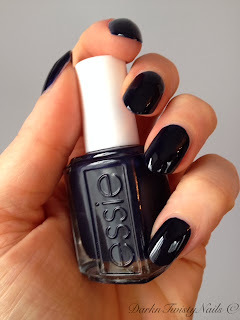 What is your favorite dark polish and did you pick up any of the Essie For the Twill of it polishes? 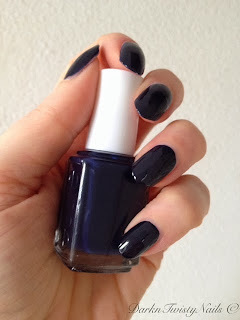 Great navy polish, I passed on this one, but I picked up Cashmere Bathrobe and was disappointed...it looks better in the bottle :( The silver shimmer is not that visible.